Hudson Valley Flying Circus | “CIRCUS FLYS” @ NATIONAL VAULT SUMMIT !!!! “CIRCUS FLYS” @ NATIONAL VAULT SUMMIT !!!! The Pole Vault Train stopped in Reno, Nevada this weekend! …… and loaded on board were 2,156 Pole Vault enthusiasts from around the world. 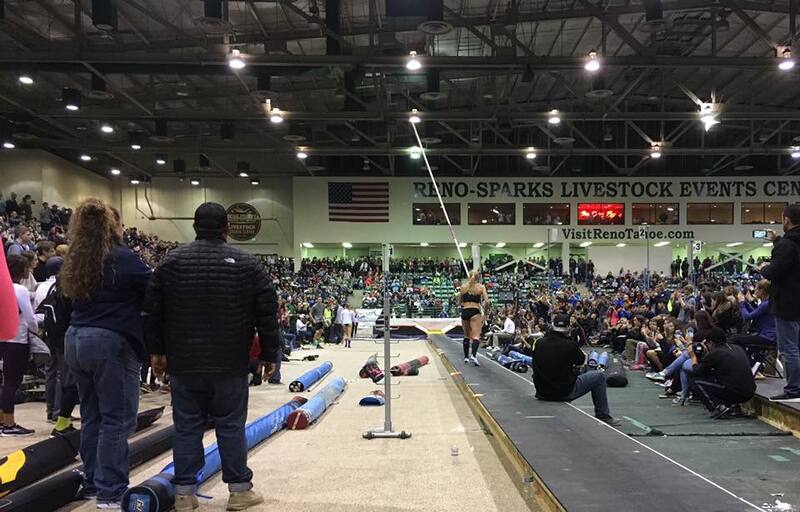 The biggest UCS Spirit National Pole Vault Summit ever was inspiring…educational and encouraging for the 23 Flying Circus pole vaulters…their 5 Circus Coaches and the 12 proud parents making the trip of a lifetime to the Mecca of Pole Vault….Reno, Nevada. We would like to thank all the athletes… and parents who traveled or who sent our most focused and spirited group ever. The new techniques learned here will help each athlete and coach reach for the skies this indoor and outdoor season. This was our ..”Best Summit Ever” and the BEST IS YET TO BE!!!! Highlights and Full Results …. Senior Madisyn Hawkins of James Coughlin,PA won the Pit 4 Competition with a personal best and school record 12′ 8″ to finish second overall among the High School Girls in the entire meet. This sprinter finished on her big pole from 8 lefts and had 3 shots at 13′ 0″ for the Lehigh University recruit. Circus team mate Abby Norvillo of Pittston Area,PA also set her school record with a runner up on Pit 4 with her 12′ 4″ clear on her 13 x 160 UCS Spirit. This diver/vaulter now qualifies for Nationals Champion section and just a junior. Pit 2 vaulters had a short warm up period ..but Michelle Rubinetti of Norther Valley-Demarest,NJ sailed high over 12′ for 6th place and a 1 foot PR from last year here. Danielle Cass of Weston ,CT sailed 11’0″ for the top 4 Circus Award. The boys were also moving the poles to vertical well… with Johannes Stromhaug of Vestel,NY winning his Pit #3 with a school record 14′ 9″ for this likable junior athlete Coached By James Cerra . Pit #4 saw Milan Spisek of Joel Barlow High School, CT soar 14′ 9″ to place 2nd and Liam Ackerman of Miami,FL and formerly of MW Circus,NY made 14′ 5″ … Marc DeLuca of Westhill,CT was super over 14′ 4″ and big at 14′ 11″ for Coach Neil Perry. Brian Runenstein(Gov. Livingston,NJ) was solid at 13′ 10″… All in all…… EVERYONE CAME THRU with BIG SPIRIT…BIG BEHAVIOR…BIG PERFORMANCES!!! !